Batu Caves Komuter station (formerly Batu Caves railway station) is a Malaysian commuter railway station at Batu Caves, Kuala Lumpur. 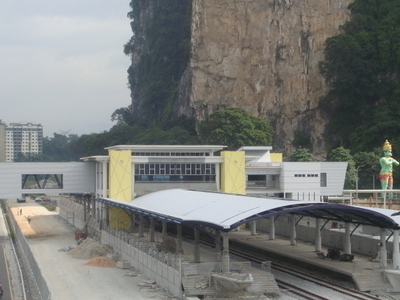 After redevelopment, the station was reopened in August 2010 is now a terminus for the Batu Caves-Port Klang Route on the KTM Komuter passenger network. The Batu Caves railway station was constructed on 1 November 1905. Over the years, the station fell into a poor condition through neglect and lack of use. The line between Sentul and Batu Caves was not included in the double-tracking and electrification of the line between Kuala Lumpur and Sentul under the Sixth Malaysia Plan (1990-1995). Since then, the station has been rebuilt and the line electrified. The existing single railway track between Sentul to Batu Caves is to be doubled, and new stations and halts built, including Taman Wahyu, Kampung Batu, and Batu Kentonmen. This project was scheduled to start before 2001, with DRB-Hicom Berhad as a contractor. The letter of intent was issued by the Transport Ministry to the company on 13 April 2001. Instead, no letter of award was issued and there was no progress until 17 November 2006 when site possession was given to contractor YTL Corporation. The project is expected to be completed by April 2010. The Sentul station is part of the Sentul Raya masterplan development under YTL Corporation Berhad. This station was opened in August 2010. Here's the our members favorite photos of "Railway Stations in Gombak". Upload your photo of Batu Caves Komuter Station!